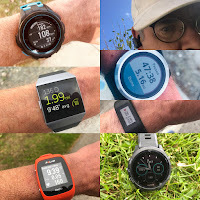 Jeff and I tested the Salomon Sense Pro Max on a wide variety of terrain from technical rocky trails, smoother Moab single track, dirt roads, and pavement. The Salomon Sense Pro Max ($150) is Salomon's first maxi cushioned shoe with a 31mm heel/24mm forefoot stack, 6 mm drop. It is available now here from Running Warehouse, Amazon Salomon Store and other retailers. My size 8.5 US weighed 10.4oz/295g so a size 9 should weigh about 10.8 oz/306 g.
The Pro Max is targeted at ultra and long run comfort. They have been very good on trails of all sorts as well as on the road. This is one incredibly versatile maxi cushioned hybrid shoe with no real compromises for road and any trail runs, at moderate paces. Pro Max features Salomon's new EnergyCell+ midsole with effective Vibe Opal vibration attenuation inserts front and back (see description of Vibe technology here) Despite the big stack and being quite stiff, they are decently responsive and easy on the legs no matter the terrain or distance. Construction features Salomon's signature EndoFit inner bootie, SensiFit overlays, and an all purpose high traction Wet Traction Contragrip outsole with a low (3-4mm) lug height fitting the all terrains purpose. The Pro Max is a strong alternative to maxi cushioned shoes from Hoka, Altra, and Skechers Performance. Targeted directly in our view at Hoka One One, they are absolutely an alternative to Hoka's Vanquish and Bondi road shoes weighing about the same and on the trail to the lighter Challenger ATR and much heavier Stinson 3 ATR, as well as to Altra's Olympus and Skechers Ultra Trail. On the road they compete with super plush shoes such as the Saucony Triumph ISO 3, New Balance Fresh Foam 1080, Skechers Ultra Road and adidas Supernova. All this versatility in the same shoe. Within the Salomon line up they sit above the new S-Lab Sense Ultra (RTR review here) and upcoming Sense Ride in terms of total cushion while being a bit firmer. This said they are not as agile and quick for varied technical terrain as the S-Lab Sense Ultra. Sam: The Pro Max fit me true to size. While more spacious for sure than traditional Salomon, the toe box is relatively low feeling due to the dense mesh and fairly substantial firm toe bumper. I found that comfort and space improved with some miles as the sock liner packed down. Overall it is has less spacious and comfortable toe box than the S-Lab Sense Ultra which has softer mesh, a softer toe bumper as well as a wider lacing throat. Those with wider higher volume feet will likely find the Sense Ultra more accommodating. The rest of the upper is snug and fits well with some pressure as Jeff notes below from the stiff foot opening at the last quick lace holes. Jeff: I have found the Pro Max, Salomon’s most cushioned shoe to date, to perform exceptionally well as a long distance trainer/racer, with it’s ample cushion, reasonable weight, generous but secure fit, protection and durability. 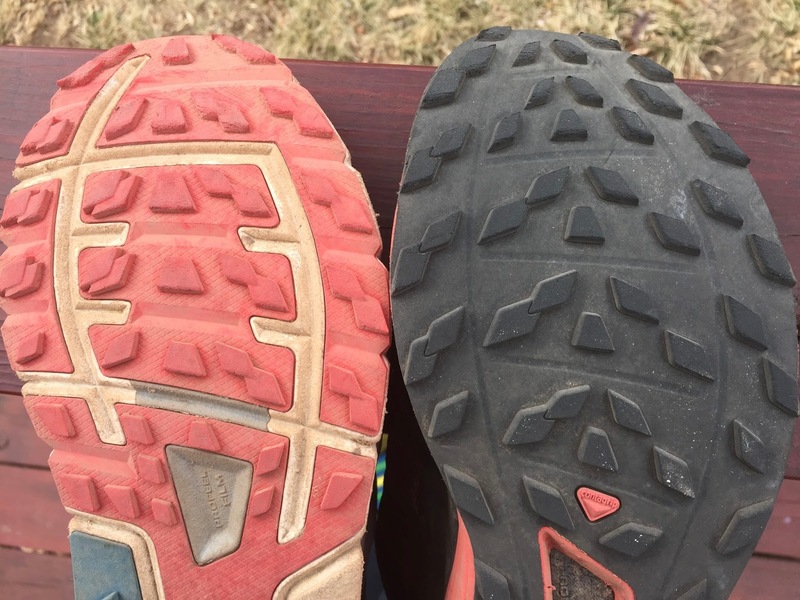 I was able to test the Pro Max on a wide variety of surfaces, hard packed singletrack and dirt roads, paved roads, rocky technical trails, steep off trail, some moderate stretches of snow and ice and was very impressed at how this shoe performed. Sam: I agree with Jeff entirely. Versatility is the name of the game for the Pro Max. For me it shined best on pavement and dirt roads and more technical trails at my slow pace. 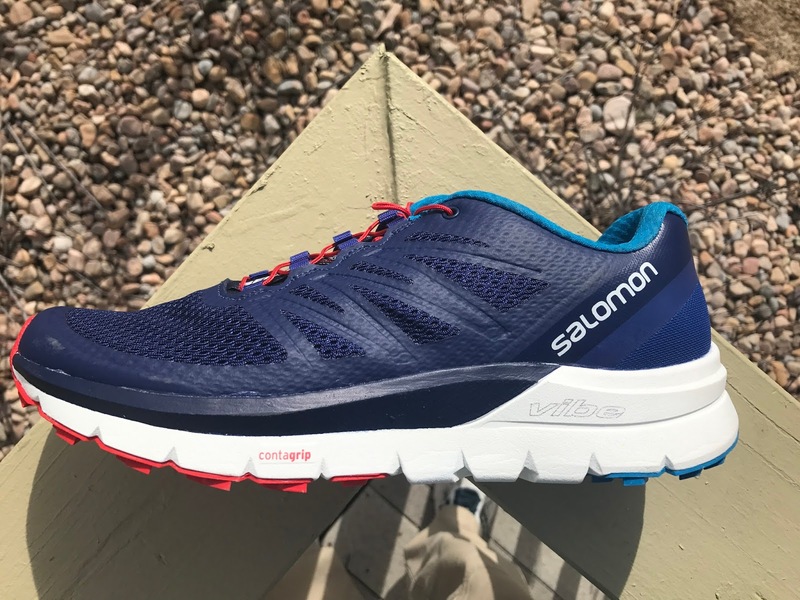 Jeff: As a maximal shoe, it is no surprise that it is a bit fatter, heavier and not as nimble as many of the other Salomons, but most of the time, you would hardly know it. Any added bulk, pays off in spades on longer runs, where the Energycell+ with Vibe and Opal inserts make for an incredibly smooth ride. At first I was a bit skeptical of the claims that Vibe/Opal really dampen the vibrations upon impact, but this is Salomon we are talking about, so, when I discovered how legit this technology really is, I was quite pleased and I guess not all that surprised by the claims. I notice this dampening mildly as I am running, more so on pavement and hard pack surfaces, as it really does make for a very smooth landing and transition, but where I notice it most is after a run, particularly when I have run a fast paced, downhill on hard surfaces, my legs feel notably less beat up and fatigued as they would with just about any other shoe I have worn to date. I found the cushioning to be moderately firm, a great mix of plush forgiveness without the mushy or sluggish feel that often plagues maximal shoes. Sam: The wide heel flare is confidence inspiring on steeper terrain for slow old me. The max cushion rolls over everything in a deliberate if not exactly agile fashion. The Pro Max is clearly not as flexible or soft as the Sense Ultra. I agree with Jeff and have written and tested the tech behind Vibe. Vibe is for real and is effective allowing a firmer midsole with ground sensation while dampening vibrations at the same time. It is interesting to see that Salomon's top of the line S-Lab long hauler Sense Ultra is a softer shoe. My sense, pun intended, is that the Pro Max for most would actually be more comfortable for very long runs as it balances firm cushioning with vibration attenuation Opal better than Sense Ultra which has no Vibe and a softer midsole. Jeff: The Sensifit/Endofit upper lives up to Salomon’s reputation and standards, which for me is the pinnacle of all shoe uppers, providing the best fit and security. The Pro Max however is slightly different from other Salomons, in that the fit is a bit more generous, particularly in the forefoot in order to accommodate for splay and swelling that would be more likely when running the longer distances that the Pro Max was built for. This is also an advantage for those with slightly more voluminous feet who have found difficulty fitting into Salomon shoes in the past. The upper is airy and well ventilated, yet does a good job keeping out dirt and debris, at least on the trails that I frequent here in Boulder. I did find the collar of the shoe, particularly near the highest lace eyelet to be a bit stiff and cause me some irritation on my first few runs. Also, the tongue is thin and combined with the fit of this shoe being slightly more voluminous, I found myself snugging the laces tighter than I might have to on other Salomon. Cranking the laces tighter for technical terrain has caused me occasional discomfort, mainly due to the pressure of the eyelets pressing on my feet through the tongue. After 30 or 35 miles or so, these concerns seemed to subside with either the materials softening, or my feet becoming a bit more accustomed to the shoe, or perhaps a bit of both. After ~40 miles or so of use, I have found that I don’t really notice any of these minor issues any more..
Sam: I mostly agree with Jeff on the upper. At my true to size 8.5 I found the upper very supportive, more supportive but not quite as comfortable as the Sense Ultra. The Sense Ultra has softer mesh, more comfortably accommodating spacious toe box and a wider lace throat, surprising as it is a top of the line long race shoe. Our understanding is that it was designed for Francois D'Haene, two time winner of the UTMB and many other ultras who prefers such comfort. The narrow Pro Max lace throat while contributing to its snug secure fit is a potential issue for those with higher volume feet who might lean to the Sense Ultra as a result. The tongue when combined with its use as the quick lace garage is thin and not as well executed as the Sense Ultra's which has longer padded wings reaching down the sides. The foot entry collar is stiffer than Sense Ultra due to the thicker materials, particularly at the end of the lacing area, I found that it was not necessary to really crank down on the laces to get great support as long as the pace was moderate. 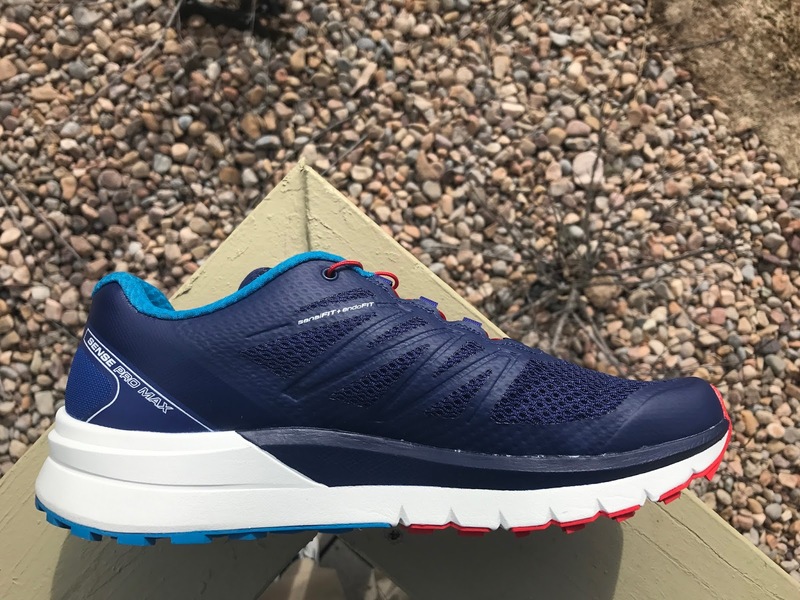 Jeff: I found that when pushing hard in technical terrain, the Pro Max performs quite well, but is a little less stable and secure than an S-Lab shoe that is a bit lower to the ground and has a more secure upper, but is competent and can easily get the job done when need be. If you consistently run in more technical terrain, the S-Lab Sense Ultra may be a better option. Sam: I don't agree that the Sense Ultra has a more secure upper but do agree that as it is lower to the ground than the Pro Max it is more stable and secure on technical ground taken fast with the exception of the upper lace up foot hold area where for me Pro Max is more secure. The wide heel platform of the Pro Max goes a long way to increasing stability on rougher terrain at slower paces. It really is fun to run downhill on smoother terrain reminding me most of the sensations felt in the original Hoka Mafate in a firmer more agile package. Those who are more agile and faster may find the wide heel gets in the way. Jeff: The wet traction Contagrip outsole has lower profile lugs, but the shape/configuration of the lugs, combined with the rubber compound, provides excellent grip on most surfaces, wet or dry. I did find that the lower profile lugs do have their limits when pushing really fast on curvy, steep downhills with gravel on hardpack, but to be fair, all but the most aggressively lugged shoes might falter a bit under the same circumstance. Sam: The Pro Max lugs are ever so slightly maybe 1mm lower profile than the Sense Ultra and smaller and less angularly aggressive. As they are under the firmer ,thicker midsole and a stiffer midsole they may conform a touch less well to technical terrain than the Sense Ultra's. Jeff: Tread wear is about average, with some noticeable treadwear in the forefoot where I toe off, but I do run primarily on steep and rocky terrain, so is about in line with what I would normally expect. Sam: At over 30 miles of roads and moderate trails my outsoles are showing no wear at all. Jeff's very technical rocky terrain taken fast may produce the shearing wear he is seeing but I am not. Jeff: When running on flatter, more moderate terrain (terrain where I would normally pick a road shoe), I find the Pro Max to run very well at slower to moderate speeds, but felt that it lacks a bit of response when really trying to push the pace. It does however have adequate responsiveness to perform well on climbs and really well on downhills no matter the speed. Sam: I agree Pro Max is no speedster. It is a long run shoe for moderately paced runs. It is fairly stiff getting in the way of faster transitions on the flat but performs more than adequately for such a big stack and great cushion. This said the moderately firm Energy Cell+ midsole combined with Vibe balances response and comfortable cushion incredibly well in such a big platform under foot. Jeff: The Sense Pro Max, with it’s excellent cushion, Vibe dampening, stability, protection, traction, quality and secure upper will certainly lead the way in the maximal shoe category and will likely be a top choice for those looking for a shoe to get them through races up to 100 miles. -.1 for stiff flex even after decent mileage. -.05 for weight. The heavily built upper could be lightened along the lines of the Sense Ultra? Sam is a 1:38 half marathoner on a good day and doesn't mind at all going into a new decade age group in 2017. He runs approximately 40 miles per week. He is the Editor and Founder of Road Trail Run and has been running for 45 years and has a marathon PR of 2:28. Sam is also the Senior Contributing Editor for Fitness Wearable Technology at Competitor Magazine. The Pro Max was provided at no charge. The opinions herein are entirely the author's. I've been eagerly waiting for this review. Which shoe would you prefer for a 100 mile race? I have very narrow feet and am leaning towards the Ultra. I've been running in the Sense Pro 2 for years and have the same lacing issue putting pressure on the top of my feet because I really have to cinch the laces. The Ultra doesn't appear to have that problem since the laces are wider. Hey Joel, tough call. 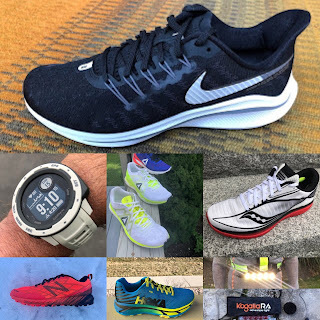 The Pro Max has better cushion for the longer distances, but if you have been OK with the Sense Pro 2, at least from a cushioning standpoint, I think you would would find the SLab Ultra to be a lateral, or even better cushioned alternative. I found the upper on the SLab Ultra to be much more comfortable out of the box, in fact, when testing, I never even thought about it, if only to recognize it's utmost comfort and security at any speed. With the Pro Max, even though the upper breaks in, I am quite often aware, that I need to snug the laces more to hold them on my feet better in tech terrain, or thinking I need to back off the snugness because I over compensated with the pressure and now I can feel the lace eyelets through the thin tongue. Jeff, great review as usual. I also like seeing Sam's input from a slightly different perspective as well. I got a pair of these back in Jan and have been putting a few miles on them as well as a few other pair of shoes. - My normal size 8 seems about a 1/4 size bigger than "true to size"
- Roomier toebox than any other Salomon I've ever worn. - Durability is also really good. I could easily see these being a good 100 mile shoe if they are properly broken in and you don't have issues with the speedlace causing soreness on the top of your foot. These wouldn't be my first choice for a 25k or shorter race on technical terrain though. They're not the most nimble shoe I've ever worn, but they do make a really good door-to-trail shoe. Will you guys be reviewing the Salomon Sense Ride before it's release? I'm liking the Vibe in the Sense Pro Max but am interested in the lower stack of the Ride. Hi Michael, yes, both Sam and I are teaming up for a review of the Ride (coming very soon!). The Ride is an amazing shoe IMHO, it essentially an S Lab quality/full featured shoe for 2/3 the price. Stay tuned! Thanks for the quick reply! I'm looking forward to the review. I just used a Clayton 2 on the trails and it was pretty great so I'm eager to see if you think the Sense Ride could provide Max style comfort in a package that can go fast. How does the cushioning compare to the Brooke Adrenaline GTS 18? I read a review that the Sense Pro Max feels hard then soft? This is what I found and just wondering if this is also the same for others? You can really let your feet fly without having to worry about beating them up to bad on sharper rocks or roots. The cushioning absorbs the impact. Part of this can also be attributed to the ProFeelFilm rock plate. I was very happy with the performance of the outsole in all conditions. It does a great job of maintaining grip. The wet traction contra grip outsole performed very well in wet conditions on rocky terrain. Overall I found the ride of the Sense Pro Max to provide an acceptable amount of comfort about 75% of the time. I like that is rebounds well, and I like the feel of the dense cushioning when running downhills on the trail. I found that for most runs the cushioning was sufficient but I would have appreciated a little more softness. I have seen this shoe marketed as a road/trail shoe but I would suggest sticking to the trails. I did not like the ride and feel of the midsole when running roads. I also found myself desiring a softer feel when running on flatter terrain. I had a consistent knee pain in both legs after running in the shoe for a few hours. We have unfortunately not tested the Adrenaline so can't compare. Hi sam with the Pro Max cushioning is it more of a firm feel then running sports shoes? Are they any good trail shoes you can recommend that has good cushioning like running shoes such as the Brooke? Thank you and i hope you can test out the adrenaline 18 sometime! Want to say thank you sam! The Brooks Glycerin 15 is the best max cushion running shoe but hope you can recommend one too for the trails that is as good with the cushion. Thank you! If you like s similar softer cushion for trail you might check out the Hoka Speedgoat 2 and Challenger ATR. The Challenger can also cross over to roads similar to Pro Max but softer while Speedgoat is soft but with a more trail specific outsole. Reviews of both a link below.